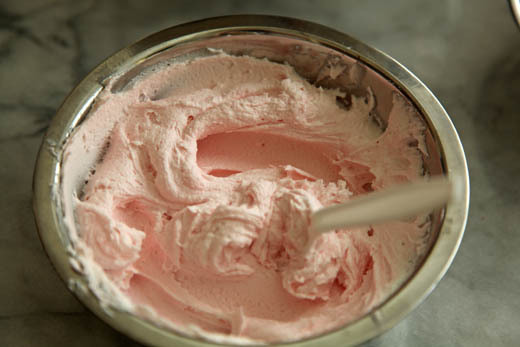 To make the icing: In a mixer combine the butter, shortening, confectioners’ sugar, and salt. Mix on medium-low speed for about 1 minute. 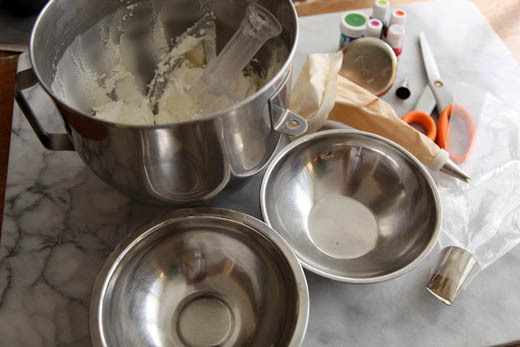 You don’t want to mix too fast or you will incorporate air bubbles into the icing. Add the cream 1 tablespoon at a time until it is smooth, but still stiff. 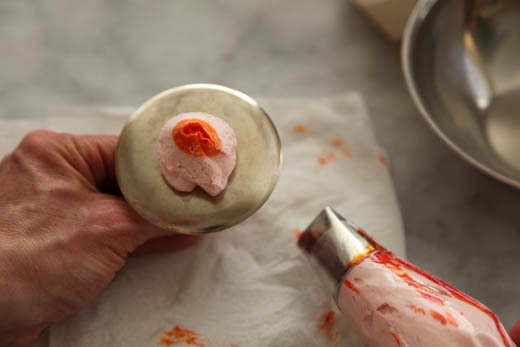 You will want several little bowls to mix the individual colored icing. Piping Bags: Disposable 16-Inch Decorating Bags – the cloth bags work too, but they tend to be stiff when you first buy them and are some work to keep clean. If you will be doing a lot of piping, then it is worth investing in some high quality Featherweight 16 Inch Decorating Bag. Extra Large Flower Nail: Ateco Flower Nail, Extra-Large Rose, 3″ Diameter – this is what you will pipe the flower on to. Kitchen Shears – These are used to lift the flower off the nail and place it on the cake. 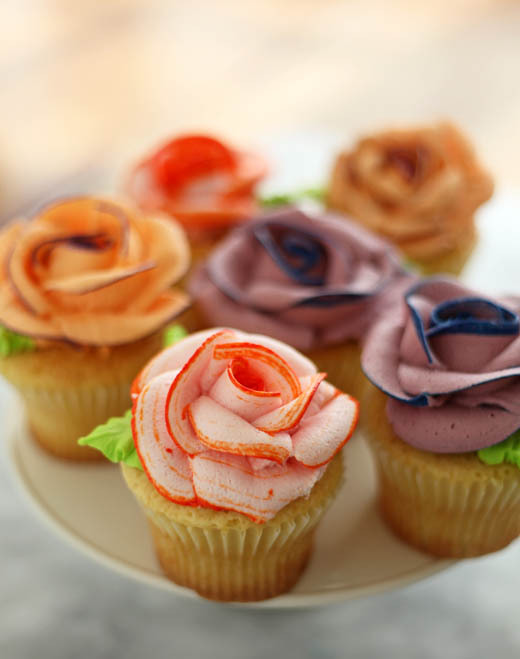 Create the color icing you want for your icing rose. You can do them all the same color or have several different ones. Start your colors light and add more color until it is just as you like. Place the rose tip in the pastry bag. 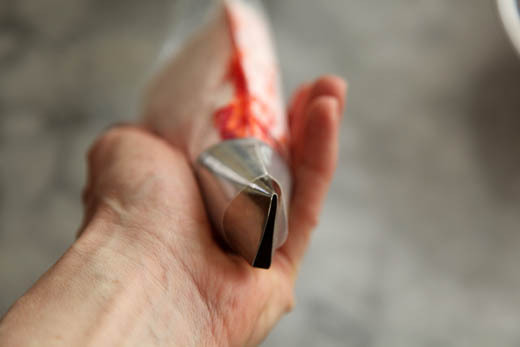 Line the narrow end of the tip with the seam of the bag. 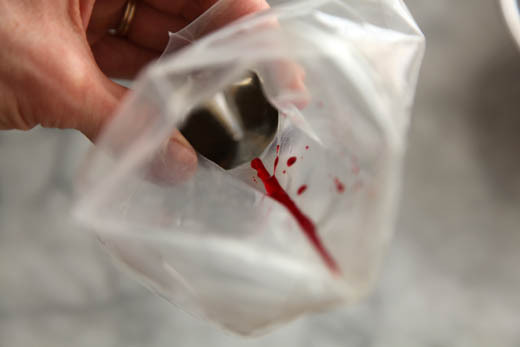 Along that seam you will drip a thin stream of the food coloring, trying not to get it on the rest of the bag. This line of color will come out as the contrasting color on the tips of the petals. Fill the bag with the icing so that it is about 1/3 full. You don’t want to over fill the bag or it will be difficult to manage as you are piping. 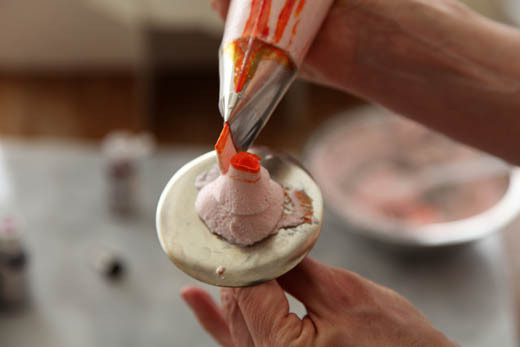 Squeeze the icing out until the contrasting color is coming out clearly. Hold the rose nail between your fingers and thumb, you should be able to easily twist the nail. 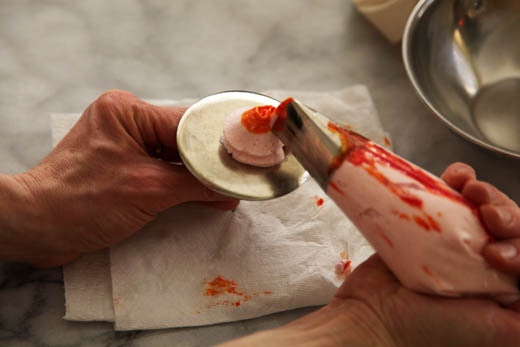 Now pipe a nice wide blob of icing onto the nail. 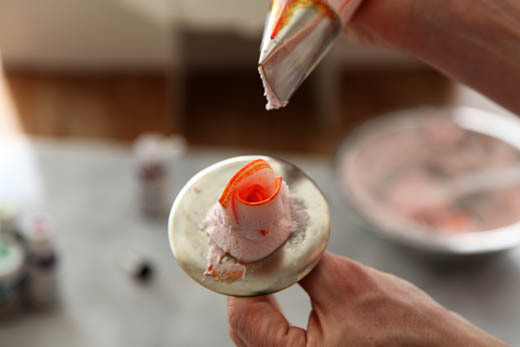 This blob will act as the base of your icing rose, so you want it to be large enough and wide enough to support the rose. The larger the rose (more petals) the larger the base. Now we will pipe the bud of the rose. 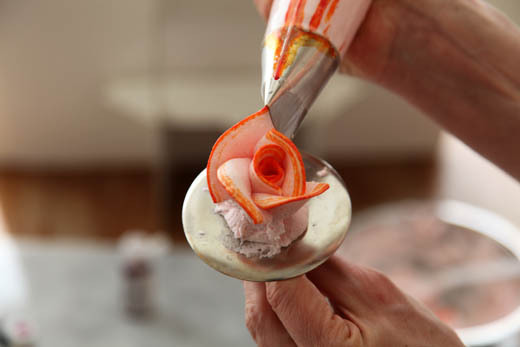 Start by holding your rose tip strait up and down, with the narrow end of the tip up. The wide end of the tip will be touching the icing blob. swing the rose tip up, around the top of the mound and back down to the starting point. This creates the rose bud. Now make the first row of petals. Hold the tip so the wide end is touching the mound about half way up, starting right where the bud finished off. Tilt the narrow end of the tip slightly away from the center. 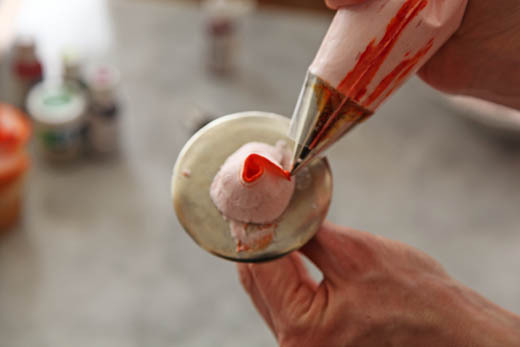 Squeeze out the frosting, turning the nail counterclockwise and move the tip up (increase the pressure) and then down (decreasing the pressure) in an arch. Form the first row of petals in this way, starting each one where the last petal finished. I usually do 2 or 3 petals in this row. Pipe a second row of 5 petals, under the row you just finished. Tilt the tip out even more with this row so the petals appear to be opening up. Overlap the petals to hide any openings between them. You can stop at any point. You may want just a few petals for a young rose or you can continue on for a more mature flower. 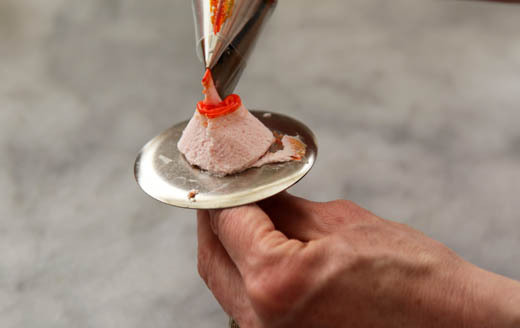 Once you have piped as many petals as you like, you will need to lift the rose off the nail and onto the cake. I do this by using a pair of kitchen shears. You will want to cut only part way through, so you can lift up the rose on the blades of the shears. 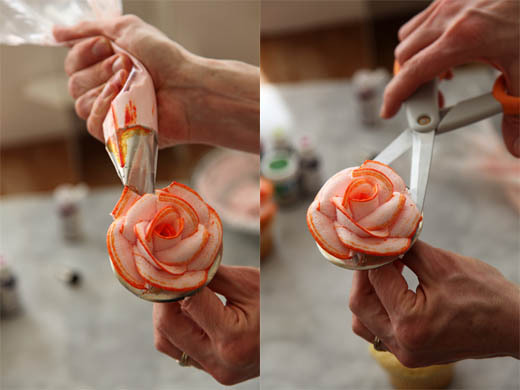 Carefully place it onto the cupcake and slide the shears out from under the rose. You will need to make sure it is well anchored so it will not move around. Using the leaf tip and green icing pipe a few leaves around the base of the rose. This is a wonderful way to hide any imperfections in your flowers. This is so pretty. Thanks for sharing the technique. wow! You’ve got some amazing skill there with those roses. It took me one horribly failed attempt to make royal icing roses before I figured it out and they weren’t half that beautiful! Simply gorgeous! Love the outcome of this technique. They look so beautiful. Love the tip of dripping some colouring down the side of the bag. What a great idea! They are adorable, if I had a little girl this would definatly go great with a tea party. Thanks for sharing your genius with us! They look gorgeous, I love to know how to make them, a lot to learn on how to make them? wearth a try!!! Wow! You make that look so easy! I love how you added food coloring to the bag for contrast. Amazing! Those are lovely, thank you for sharing this technique! These are absolutely beautiful, I can’t wait to try these. So beautiful! I’m going to try your strip technique next time I do roses. your roses are really delicious. Thanks for the recipe. You can use either one in its place with great results. These are a work of art, Zoe! Truly stunning! I must say it has been a joy to know you and then share in your many baking adventures! I should take a picture of my copy of your book, “Artisan Bread in Five Minutes a Day” and show you all the post it’s marking each page I want to try! Next on the list is the Challah or Pannetone. I will let you know which I make. Your patience is incredible and your non-edible flowers are as pretty as the real ones. Keep baking wonderful things and making me feel really privileged to know you. I am going to church with mom and dad tomorrow, which will be an ANSWERED PRAYER FOR ME AND SO WONDERFUL SINCE DAD IS 83 AND MOM IS GONNA BE 80 COME JUNE 19TH. You’re very kind: very fast answer. I’making them tomorrow, trying with cup measurement (is your husband still at work about the conversion in grams? ): I’ve bought a cup set just for your beautiful recipes. This is absolutely insane! As in incredible insane! Plain ole’ piping of cookies stresses me out much less this. So creative such a craft!! I will make sure to tune in to the Cooking Channel I am yet to catch your program!! Thanks for the kind words! Maybe someday I will take my show onto the small screen, but at the moment I am blogging for them in a post we call the Weekend Baker! Absolutely gorgeous, I have never seen anything like this. You are truly talented. I have always wondered how to make those! You make it look so easy. Thanks for sharing! Those are beautiful roses! I love the contrasting color strip! Lovely pix…yours was one of the first food blogs i started reading 4 years ago and ‘ve always been blessed with truly memorable recipes here..be it the exotic carrot cake or the Mocha buttercream….infact the step by step pix was such a confidence booster when i made my first buttercream…great job as always! These cupcakes are beautiful. You are an inspiration. I have 2 sons, who love to cook, but I think to have these on my Mother’s Day table, I must enjoy the experience myself. What a wonderful gift. Thank you. I’ve always wanted to attempt these! Thanks so much for the tips – I’ll definitely be trying these soon! Thank you so much for sharing this technique. I was always wondering how to make those pretty roses, and with the different color strike they are extra pretty. BEAUTIFUL! Thanks for the tip on how to get your petals in the contrasting colours…because that is what I was going to ask you how to do! These flowers are simply beautiful! I’m only 16, and tried these for my mom on mothers day. She loved them, and cried! (: Anyways thank you so much Zoe. Your recipes inspire so much, I cannot thank you enough! What a fantastic gift to give your mom! If my children had made this for me, I would cry too, just for the love that went into it! Absolutely beautiful. The strip technique is awesome, what a wonderful idea! These look amazing! Thank you so much for sharing. I want to try this technique for my mom’s birthday next month as was wondering – can I make these ahead of time? Would I be able to, for example, freeze these? That is an excellent question. I have never frozen them before serving them. I have frozen the leftover cake and icing, but have never worried about the flours staying in tact once they have thawed. Are you hoping to make them and freeze them on the cake or separately? Thanks for your quick response! I’d like to make them a day or two before the party and then place them on cupcakes the day of. I’m worried I won’t have time to do it all in one day, so I’m hoping to buy some extra time :). I think this can work, but you will have to be very careful that they don’t get damaged when you are putting them on the cake. You might want to do them the day ahead, line them up on a cookie sheet and just refrigerate them, then there will be less condensation when you take them out. Thanks for the great advice, Zoe! I’ve never used this technique before and will hopefully find some time to test it out. I’ll let you know how it goes! These are divine and I have been practising these roses for a couple of weeks (as I have been asked to make cupcakes for a friends engagement party). You want to use the gels, or paste, which are much thicker and will have a sharper edge to the color. I often have to squeeze the first little bit out of the bag, until the icing and the gel have a nice smooth line. 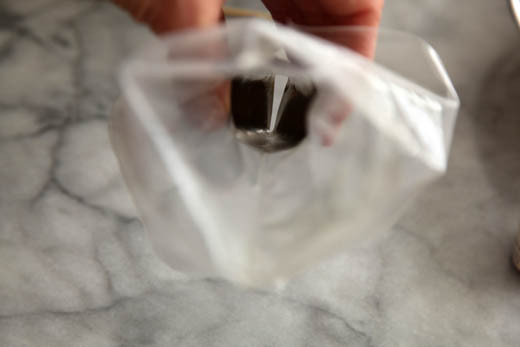 Use a skewer to gently create a smooth line of gel down the seam of the bag. If the gel has any lumps in it, then you may need a fresh bottle. 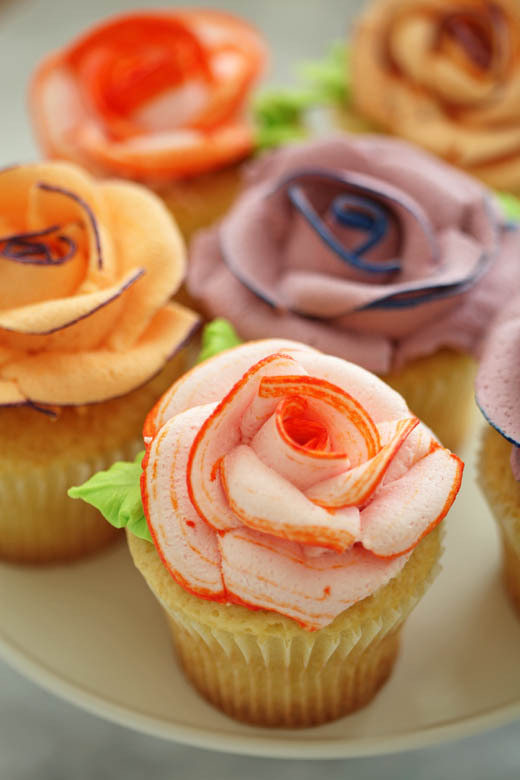 I loved the idea with the two coloured roses on top of cupcakes. They are so beautiful that i wanted to make them for my parent’s birthday. But my thing got waaay too liquid. What could be the problem? I didn’t have a rosenail so i had to use something else, but still it was all just melting down and not very stiff 🙁 Could you give me a hint what could’ve been the problem? Were you using the buttercream icing? Was the butter very soft when you were mixing it up? It should be soft, but not mushy when you add it to the meringue. Give me a bit more detail and I will try to figure out what went wrong. I realy appreciate the tips, you have make my day. Great tutorial, Zoë. It’s funny, with everyone into cake decorating these days, you don’t see many roses anymore. Yours are perfect on top of those cupcakes! Amazing! Thank you so much for the step-by-step. those are lovely and beautiful and thanks for sharing the technique how to make an icing sugar rose flower! Wow! Beautiful! I will try this! What a wonderful tutorial! Thank you for sharing this. Absolutly LOVE your roses! I’m into baking now, and this would be an awsomw thing to try!!! I was wodering what type of food coloring you used for the contrasting stripe of color? gel, liquid or paste. Do Iuse the same method for smaller roses? That is actually a good question, it made me stop and think a bit. It does seem that a non-liquid would have a better chance of sticking to the place it should be, in the piping bag, that you could get a better line with a gel or paste. If you happen to see my comment, would you tell me if you tried one of these? I am so frustrated when it comes to decorating, I think it was why I stopped baking, which I miss terribly now (I have a terrible oven. No mater how careful I am, how many thermometers are going, stuff ends up half bunt and half underbaked). Anyway, sorry to go on and on! I would love to know if anyone tried a gel or paste – i just have a feeling gel would work well. I hope you got to try! I’am a pastry student and i really like your page. I will follow u so i learn more and more about this amazing world! Wow, what an amazing technique! 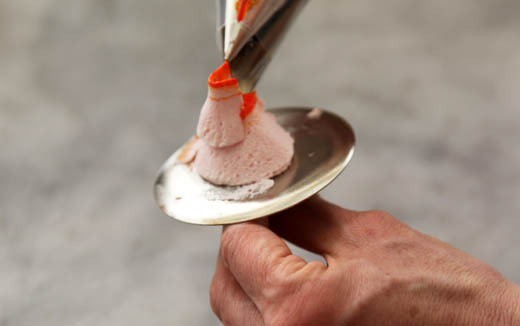 I’ve had that tip on my piping bag for ages and never knew what to make (or use) it for! Thank you! Thank you so much for sharing the rose making idea. I am going to try this in the morning. 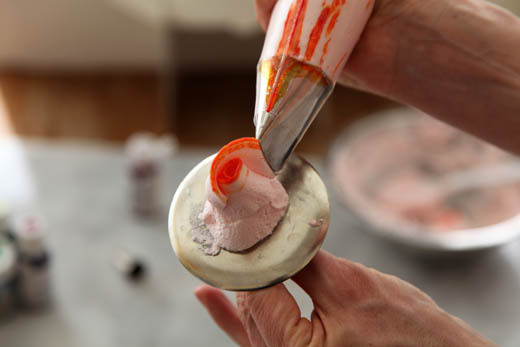 I’ve shied away from “piping art” for the longest time ever because it looks so daunting & have been hunting around for a clear & concise tutorial – and I found it here! Thank you, so glad you enjoyed the video! Wow! How did you do those flawless roses? I have to give these a try this holiday season. These look absolutely beautiful. the icing looks so pretty! keep up the good work! So, so pretty with the line of food coloring! Love them! They are so beautiful.I am making my brother and soon to be sister in laws wedding cake and also mine for my 7th wedding ann. Do you have to use that much confectioners sugar or can i cut it down a bit? . Used this post many times to help master frosting flowers! thanks! I recently linked it to my blog as one of the best posts I’ve found online to demonstrate making frosting flowers! I’m so happy it was helpful! I tried making these last night and I was so bummed they didn’t look as pretty as yours! The roses were too soft and kept sagging, then I tried adding powdered sugar and the roses were too stiff and the tops of the petals were cracking 🙁 I signed myself up to make 100 of these for an event this weekend and I am panicking because I feel like they are going to look horrible! Any tips? If you still have some of the icing left, try adding a bit of milk to what’s remaining until it is the right consistency. If you are making a large batch of any icing, it may require a little more sugar or liquid to get to the right consistency. Thanks! I actually got mad and threw out the icing but I tried it again last night and I made the frosting and I made it to the point it was so stiff it wasn’t sticking to the bowl then I added a little more cream to it and it piped out perfectly! Also, instead of dealing with the mess of the nails and trying to lift them off without them falling apart, I just piped the roses directly on the cupcake and I was very happy with the outcome! So that’s how it’s done! Thank you! And thank you for including links for the equipment so that newbies like me can see exactly what tools you are talking about. I wonder, do you know, if you could use a buttercream or similar icing, instead of the recipe you have given? Many thanks. You can use almost any icing that is pipe-able. Meaning, it can’t be too stiff or too thin. This is so wonderful. I now know how to make roses. Hello! I am hoping to do this for a wedding shower next weeked but I have one question: in the recipe, it says cream. What kind of cream? I always use heavy whipping cream. zoe, is it possible to use swiss meringue buttercream for these roses? 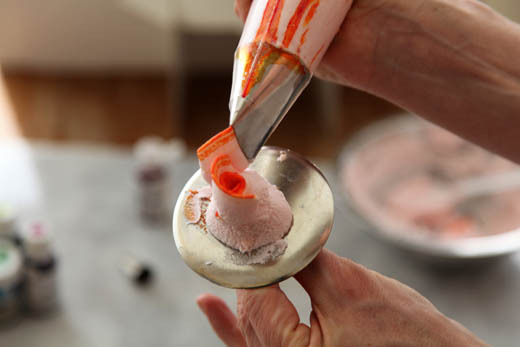 or do you have any tips for the smbc to make it firmer for piping such roses? thanks! I mean vanilla extract: http://zoebakes.com/2012/01/03/homemade-vanilla-extract/ or store bought. can you advice a suitable alternative for shortening? You can use butter. It has a lower melting point, so be careful that you don’t grip the bag too much or the buttercream may get soft. Just wondering if it matters what shortening? What brand do you use? Thank you so much for sharing your knowledge with us. 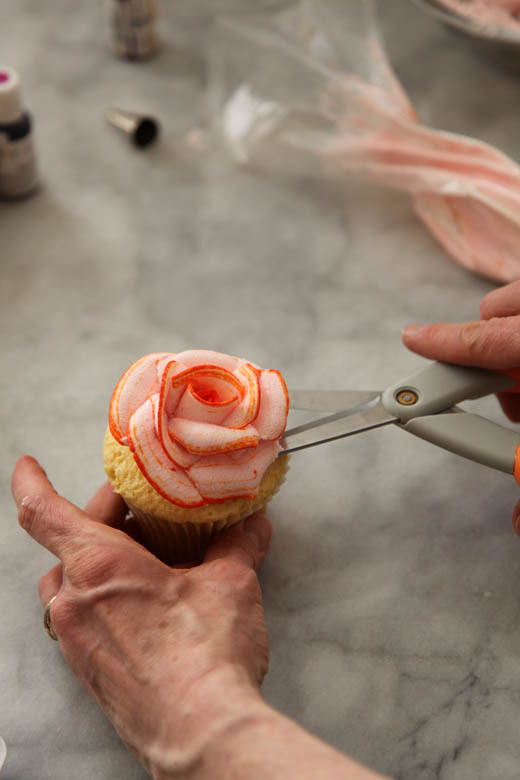 Could the roses be piped directly onto the cupcake, eliminating the flower nail? Hi, for making flowers that hold theirs shape, which one is the best, shortening or butter?do yours hold their shape? Thanks.